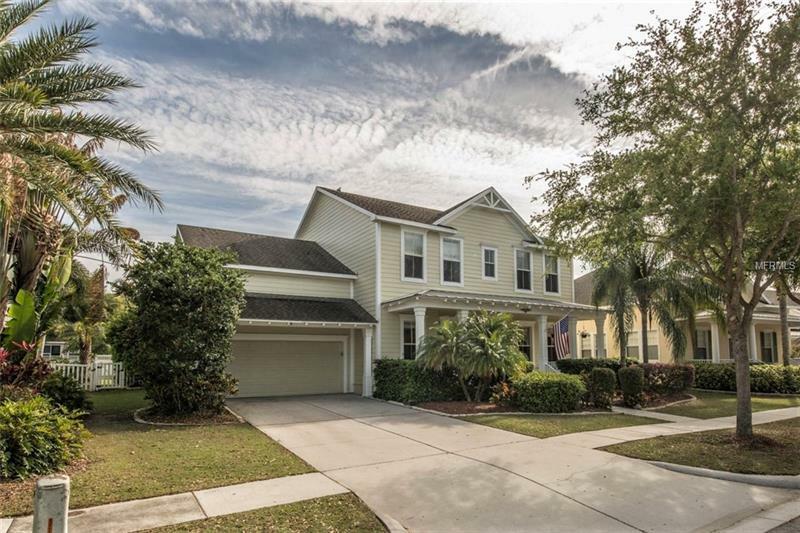 Located in the highly desirable Mirabay Community known for the great luxuries Florida has to offer! Direct Access to the Bay! This beautiful turn key home provides wide open Living and Socializing space with Tile and Wood flooring throughout 1st floor. Excellently maintained. The Oversized Kitchen with 42â Cherry Wood Cabinets Stainless Steel Appliances Tile backsplash and huge breakfast bar overlooking the Living Room with 20 ft ceiling. Two sets of French Doors opens up to the gorgeous fenced yard almost a Â¼ acre lot with irrigation system. Entire lot is Loaded with beautiful Trees and shrubs. The 10â by 10â Therapeutic Spa with full wrap around bench jets on all sides lighting surrounded by brick pavers. Master Bedroom and Office with French Doors(that can be turned into a bedroom) are located on first floor! Master Bedroom has Personal door to Spa. Decked out Master Bath has Garden tub with jets stand alone shower Dual separated sink areas and oversized walk-in closet (full racks). Stairs leading to huge loft area for personalized space. The oversized 4th bedroom tucked away with full bath offers special area for staying guests. Large covered front porch to sit back and relax. Intercom system w/ radio in every room. All appliances convey! This 3500 sq.ft. home is exactly what fits this Gorgeous Community! Centralized Clubhouse with beach access pool outside diner Fitness Center training classes tennis courts and Much More! Donât be left out as this home is priced to steal!